PROTECT THOSE EXPENSIVE PADDLES! ...Paddles don't get lost or banged up when you have proper storage. Black Powder coat Steel. 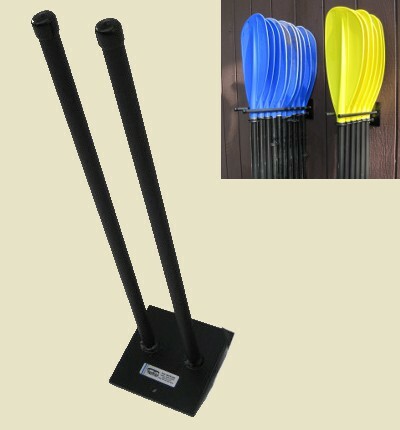 Special No-slip rubber padding on rods to hold paddles securely -paddles cannot be knocked loose. Hanger holds up to 14 canoe paddles or 10 kayak paddles. Mounting hardware included. Made with care right here in New York State! Black Powder coat Steel. Special No-slip rubber padding on rods to hold paddles securely -paddles cannot be knocked loose. 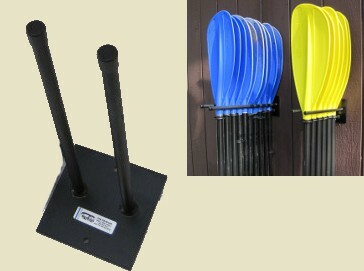 Hanger holds up to 6 canoe or kayak paddles. Designed just for the PLAID PADDLER (...aka the Man from Plaid). 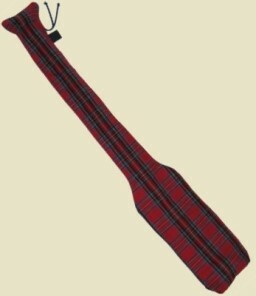 Protect your trusty paddle with our Tartan fleece Paddle Sock! Perfect for storing or transporting up to a 50 inch canoe paddle OR up to a 230cm two-piece kayak paddle. 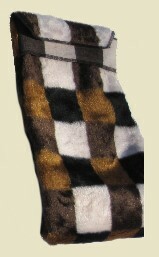 Protect and store your paddle with our Faux Fur Paddle Sock! Extremely durable short nap faux fur. Oversized fold over containment lip with drawstring. 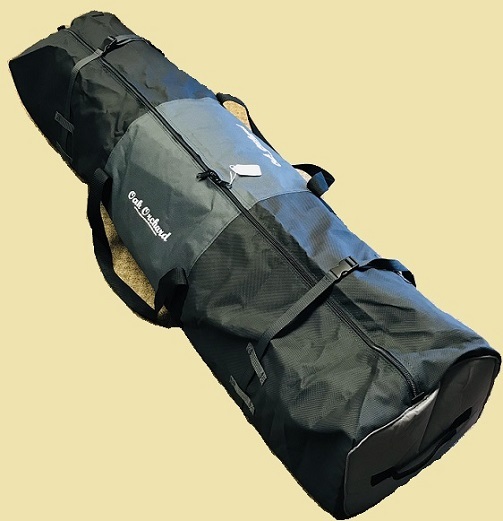 Perfect for storing or transporting up to a 52 inch canoe paddle or up to a 240cm two-piece kayak paddle. This sturdy nylon material is the ideal combination of durability that is also light and flexible so the bag may easily be folded or rolled when empty. Paddles slide easily in or out thanks to full length dual zippers. Two reinforced cinch straps keep your items secure... cinch them up for longer items like paddles OR let them out for bulky items like pfds! Our sturdy Grab handles on each end are great when you go to pull the bag out of your truck, trailer or boat. Dual central carry straps allow for an easy, balanced carry. The Junior is a real canoe paddle, not a toy, sized proportionately for younger paddlers. Blade, shaft, and grip are sized for smaller hands and are built for balance. The 5 1/2" wide beavertail styled blade is well suited to smaller paddlers and the average weight of 15 oz. is no burden. Our Junior is a great way to introduce children to proper paddling technique and increase their interest in the sport--everyone likes to feel like they're part of the fun. Laminated basswood construction is durable and lightweight. Sailing paddlers take note; the Junior makes a superb, stowable, one handed or emergency paddle. You'll see experienced recreation and sit-on-top kayakers using a 48" Junior paddle in sections of twisty creeks too narrow for their double blade. Our 36" size is very popular with Trophy shops to customize but all three sizes are made to be used on the water and sized for proper balance. 36" Junior paddle; blade length 15.5in, blade width 5.5in, shaft length 20.5in. 42" Junior paddle; blade length 18in, blade width 5.5in, shaft length 24in. 48" Junior paddle; blade length 20in, blade width 5.5in, shaft length 28in. Shipping ok to 48 States. This is a sturdy all-purpose paddle. Tempered-aluminum shaft with a 12" HDPE grip surface for sure handling. Blade and T-grip are molded of high impact polypropylene. Lightweight and durable; this is a very sturdy all-purpose paddle. Tempered-aluminum shaft with a 13" HDPE grip surface for sure handling. 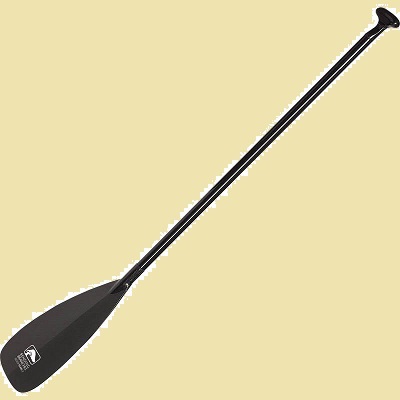 Our Livery paddle is Cheap -but not so cheap you'll be up the creek without one! Choose Length: 48 inch, 54 inch, 60 inch or 66 inch. Our favorite rental paddle for many years. Very strong! 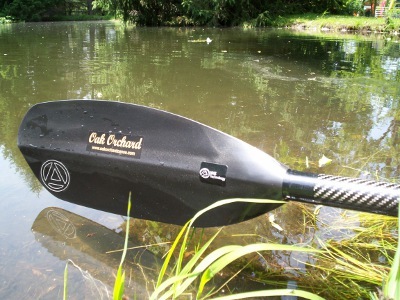 Our Heavy Duty Livery Canoe Paddle has a tuff 20" x 8" blade. Heavy Duty tempered-aluminum shaft with extra reinforcement. HDPE grip surface for sure handling. T-Grip handle. Available with Red shaft/Red blade or Green shaft/Yellow blade. Choose 54 or 57 inch length. A light and durable Basswood paddle with Rockguard tip. A pleasure to use. 19 1/2" x 6 3/4" blade. Light but sturdy enough for adventure! Laminated shaft with laminated basswood, locust, and ash woods in blade. A Rockgaurd tip wraps the bottom edge of blade and really holds up great! "Our customer's favorite straight paddle." 20" x 7 1/2" blade. Choose length: 52", 54", 56", 58" or 60". Handmade basswood traditional beavertail paddle with a rockguard tip. Smooth, quiet and durable. 22" x 5 3/4" blade. Our handmade basswood traditional canoe paddle with a rockguard tip. Handmade cherry traditional Ottertail paddle with a durable rockguard tip. Note; with this model we recommend a few inches longer paddle than normal. Due to the long narrow blade, the shaft length is shorter than most of our other canoe paddles. 23 1/2" x 5 1/2" blade. Beauty meets performance with Bending Branches' Espresso 14 degree bent shaft all black willow wood canoe paddle, reinforced with a glassed blade and wrap around Rockgard. This is the new Bending Branches Java straight shaft canoe paddle. Shaft is solid Basswood. Blade is roasted Basswood and Butternut woods laminated with 2 ounce fiberglass. The wrap around Rockgard tip will keep this paddle strong and beautiful for years to come. Blade Size: 8" x 19"
This is the new Bending Branches Java 11 degree bent shaft canoe paddle. 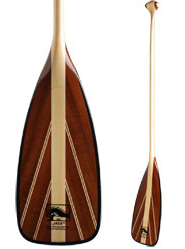 Our Sunburst canoe paddle combines years of craftsmanship, with state of the art composite technology. Sunburst is a dream to paddle. From tip to grip this paddle is designed with the frequent canoeist in mind. The Sunburst will provide years of comfortable, worry-free paddling and propel you to places you've only dreamed of. Blade Size: 8" x 17"
Heavy Duty Rockgard blade tip protection plus 2 oz. fiberglass over entire blade. Strong T-700 Carbon Shaft is tapered for more natural feel and comfort. Weight: 16 oz : weight based on average weight of 54" paddle: due to the natural variations in wood, weight could vary by +/- 10% . Blade Size: 8.2" x 17"
Weight: 17 oz : weight based on average weight of 50" paddle: due to the natural variations in wood, weight could vary by +/- 10% . 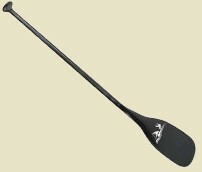 The Bending Branches Black Pearl II is a fine carbon canoe paddle weighing in at just 16 ounces with reinforced Edge guard nylon protection on the blade. 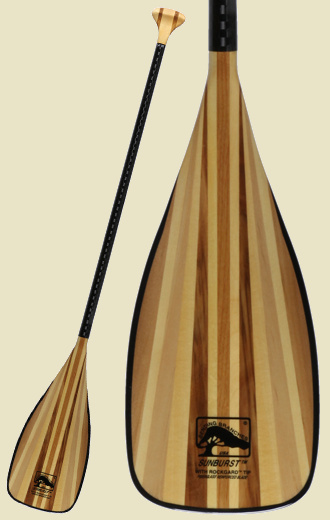 This paddle is perfect for canoeists who want fewer ounces AND more years from their paddle. Designed with an 11-degree bend, the Black Pearl II is a wise choice from every angle. Free shipping included to 48 States ! The Bending Branches Expedition Plus wood canoe paddle stands up under the demanding conditions of long wilderness trips. Paddlers who need endurance, power, and control in their canoe paddle will love the power T-grip and sturdy laminate shaft of the Expedition Plus. Rockgard edge protection that extends all the way from the blade tip to 6 inches up the shaft. A wrap of 4 oz. fiberglass further protects the red alder, basswood, and roasted basswood blade for maximum durability. Expedition Plus is both attractive and versatile for paddlers who take their time on the water more seriously. Shipping; shipping ok to 48 States. 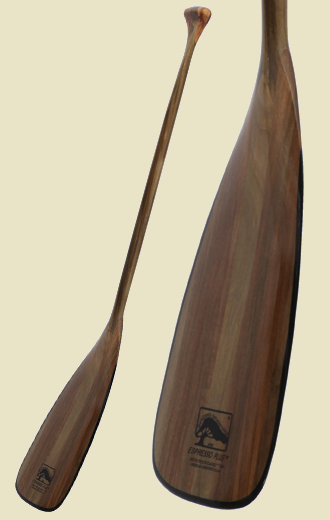 The Fleetwood by Grey Owl is a finesse paddle for the coinsurer of paddle sport. Ultra Light for endurance. Sturdy for expeditions. Straight Shaft. Straight Shaft: 5 ply laminated 1/4 sawn cedar and basswood, oval 1.125 inch x 1.06 inch. 54 inch size: shaft 33.0in, blade length 21.0in, blade width 8.0in, blade area 110 sq.in., weight 15.5 oz. 56 inch size: shaft 35.0in, blade length 21.0in, blade width 8.0in, blade area 110 sq.in., weight 17 oz. 58 inch size: shaft 37.0in, blade length 21.0in, blade width 8.0in, blade area 110 sq.in., weight 18.5 oz. 60 inch size: shaft 39.0in, blade length 21.0in, blade width 8.0in, blade area 110 sq.in., weight 20 oz. 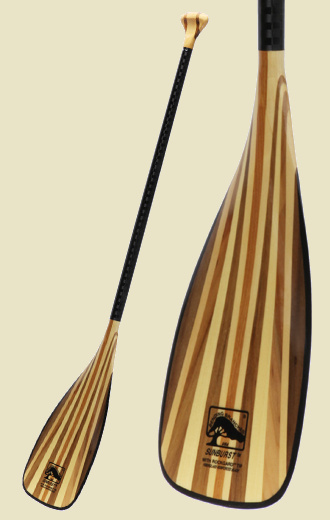 The Monarch by Grey Owl is a finesse paddle for the coinsurer of paddle sport. Ultra Light for endurance. Sturdy for expeditions. 14 degree Bent Shaft. Grip: 5 ply laminated basswood, cobra shape. Shaft: 8 ply laminated white cedar and basswood, oval 1.18 inch x 1.06 inch. Blade: 9 ply laminated white cedar with clear 4oz fiberglass cloth overlay. Blade Cross Section Style: curved, cambered. Tip Material & Style: epoxy casting, complete blade edge. Finish: high gloss exterior polyurethane with UV block. 50 inch size: shaft 32.0in, blade length 18.0in, blade width 8.75in, blade area 95 sq.in., weight 15 oz. 52 inch size: shaft 34.0in, blade length 18.0in, blade width 8.75in, blade area 95 sq.in., weight 15.5 oz. 54 inch size: shaft 36.0in, blade length 18.0in, blade width 8.75in, blade area 95 sq.in., weight 16 oz. 100% Carbon blade, carbon shaft with a smooth comfortable carbon palm grip. Versatile 10 degree bent shaft. Super light yet also very durable. Blade - 19" x 8 3/4"
Choose 50", 51", 52", 53" or 54" length. NEW, and better than ever. We've sold this paddle for over 20 years, it's always been a rugged paddle but today's version has a more refined shape and better handling. Laminated basswood shaft. Locust, cherry, & basswood blade with rockguard tip. A real value among bent shaft paddles; the BB is durable, light and a real upgrade in ease of paddling compared to a straight shaft paddle. choose 48", 50", 52" or 54" length. Looking for the lightest bent shaft canoe paddle? We offer sizes for traditional canoes and also for Pack style canoes. Our FeatherLite is smooth through the stroke, quiet, a pleasure to use. Full carbon fiber shaft with full carbon fiber blade. Comfortable palm style grip. Choose 46", 47", 48", 49", 50", 51", 52", 53" or 54" length. Looking for a Bent Shaft canoe paddle that's really tough but light? Our Max with a fiberglass shaft and a fiberglass reinforced nylon blade is the answer. MAX is a great choice for expedition paddling since it's light weight but also really tough for high OR low water levels. Choose 50", 52" or 54" length. Looking for a Bent Shaft canoe paddle that's really tough but very light? Our Max with a carbon shaft and a carbon reinforced nylon blade is the answer. MAX is a great choice for expedition paddling since it's very light weight but also really tough for high OR low water levels. The Oak Orchard Double blade, aluminum shaft, Heavy Duty fiberglass/nylon blades. Extra Tough for any waters; yet still light weight to cover a distance quietly and efficiently. 2-piece anodized aluminum shaft design is snug fitting and trouble free, composite ferrule offers 3 variable feather angles. Ovalized grips provide all day comfort. Fiberglass/nylon blades are very tough and maintenance free. Mid size blades for that perfect blend of power and smooth handling -there's plenty of surface area for quick maneuvering but not so much to make paddling seem like work. Our 260cm size Double Blade is perfect for any paddler in a canoe or the extra-wide fishing kayaks with hi/lo seats. Choose 240cm, 260cm OR 275cm. The Oak Orchard Double blade, fiberglass shaft, Heavy Duty fiberglass/nylon blades. Extra Tough for any waters; yet still light weight to cover a distance quietly and efficiently. 2-piece fiberglass shaft design is snug fitting and trouble free, composite ferrule offers 3 variable feather angles. Ovalized grips provide all day comfort. 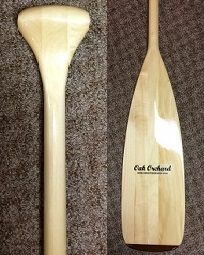 The Oak Orchard Double blade paddle, fiberglass. Super Light to cover a distance quietly and efficiently. 2-piece fiberglass shaft design is snug fitting and trouble free, composite ferrule offers 3 variable feather angles. Fiberglass shaft is light weight and has excellent balance. Ovalized grips provide all day comfort. Carbon/nylon blades are rugged, light and maintenance free. Mid size blades for that perfect blend of power and smooth handling -there's plenty of surface area for quick maneuvering but not so much to make paddling seem like work. Choose; 240cm, 260cm OR 275cm. 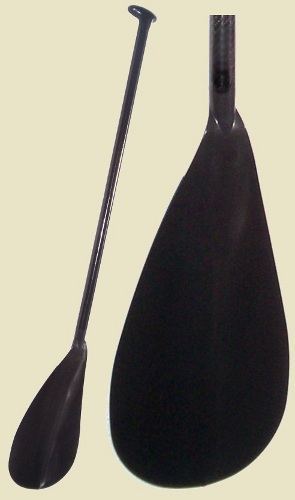 The Oak Orchard Double blade paddle, carbon. Super Light to cover a distance quietly and efficiently. 2-piece carbon shaft design is snug fitting and trouble free. King-Pin ferrule design offers variable feather angles with easy operation and NO wiggle at the connection. Carbon/nylon blades are rugged light and maintenance free. Mid size blades for that perfect blend of power and smooth handling -there's plenty of surface area for quick maneuvering but not so much to make paddling seem like work. Carbon shaft is light weight, sturdy and has excellent balance. Ovalized grips with a medium shaft diameter provide all day comfort. This paddle is Made in USA. Choose 240cm, 260cm OR 270cm. The new double-bladed Impression paddle is perfect for the solo paddler who needs efficiency and a smooth stroke; regardless of conditions or headwinds. Shaft; 2-piece Basswood shaft with a snug fitting composite ferrule. Blades; Laminated Basswood and Butternut blades with Rockgard tips for years of use. Our 260cm size Double Blade is perfect for any paddler in a canoe or the extra-wide fishing kayaks with Hi-Low seats. Craftsmanship is impeccable, just like you'd expect from Bending Branches. Excellent value in a lightweight and rugged oar. Its shaft is made of lightweight aluminum and reinforced the full length of the blade to ensure maximum strength and durability. A 5.5" x 26" blade delivers superior power and control. A contoured handle makes maneuvering easy and comfortable. Proper oar length varies with the width of your craft but in general we recommend 6ft for most canoes, 6.5ft for extra wide canoes and 7ft for most aluminum rowboats. Oarlocks and sockets are sold separately. Super tough and light weight T-700 Carbon fiber shaft, 2-piece take-apart construction, Straight shaft, dual high-visibility tape measure (cm/in). Tough Composite blades are also Very Light Weight. Blade dims; 19" x 6.8" More Surface Area, More Power; 104 cubic inches. Choose Color: RealTree Max5 camo. OR choose Adjustable Length/Adjustable feather angle. Free Shipping, shipping included to 48 States. Used as a stakeout/push pole for kayaking, this product has many great features including a floating base, a fiberglass body, and a foot and tip that are are UV stable and made of wear-resistant nylon. Lightweight and incredibly durable, this product makes the perfect companion for fishing in shallow waters.